Maison Louis Carré was designed by Alvar Aalto for the French art dealer and collector Louis Carré and his wife Olga in 1959. This masterpiece of modernist architecture combines buildings, garden, furniture and interior design, resulting in a total work of art. It is Aalto’s only remaining building in France. 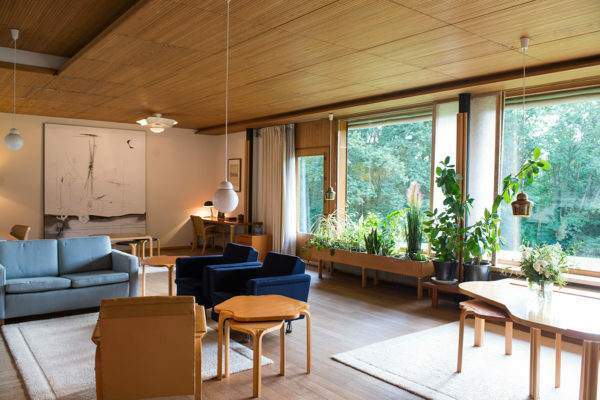 Ásdís Ólafsdóttir, the director of Maison Louis Carré, invited us for a journey to discover the universe of Alvar Aalto and shares with us the history of the house and her vision of today’s Nordic design. You have been the director of Maison Louis Carré since it was acquired in 2006. How did you end up being involved with Aalto’s design, and Finnish design in general? What is your background? 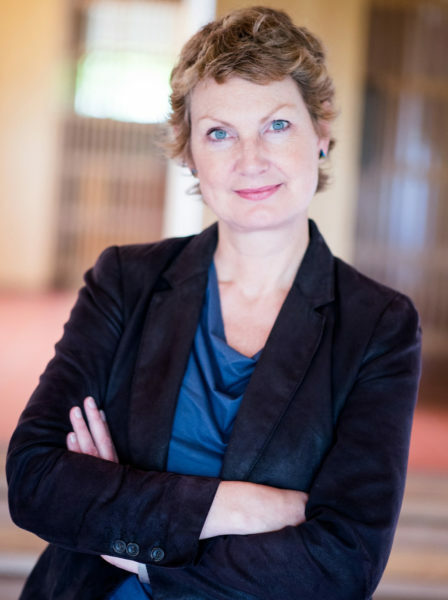 I am originally from Iceland, and came to France to study art history. I wrote my doctoral thesis on Alvar Aalto furniture and the international diffusion of design, which led me to collaborate with the Alvar Aalto Foundation and the Alvar Aalto Museum on various projects. When Olga Carré passed away in 2002, the Maison Louis Carré was put up for sale by their heirs, and I had several opportunities to visit the house back then. I researched the archives, and then in 2006, the Finnish Cultural Foundation acquired the house. I was part of the team that took care of the inventory of the house, and of developing the strategy regarding house’s opening to the public. There is a very particular atmosphere in the house resulting from this division between the public and private side. Which kind of audience visits the villa? Our very first visitor was a Japanese – the Japanese love Alvar Aalto! Obviously, there are many French architects among the visitors, and who already are familiar with his work. The villa is also an important destination for architecture students: the circulation of spaces, the use of materials and the play of light are exemplaries. The conservation of the everyday items – books, clothes, all the original design – has helped us maintain the integrity, while contributing to the exceptional side of the house. The objects help to preserve the atmosphere of the place – you really have the feeling that the building is still inhabited. This allows people to discover the lifestyle of a wealthy and cultured couple in the fifties and sixties. In the Nordic countries, a house is centred around the idea of habitation. There, design implies something more democratic: a wider part of the society can allow itself to have design pieces. What would you say about the differences between the Nordic and French design, especially with regards to a general status that people usually give towards design? In France, the design is more involved with the idea of representation. For the French, the idea of a house goes beyond habitation: the notion of reception through a dining room and a living room is very important. A certain status is displayed through the objects, also because designer furniture is quite expensive. If you are interested in design, it means that you possess a certain cultural and material status. In the Nordic countries, a house is centred around the idea of habitation. There, design implies something more democratic: a wider part of the society can allow itself to have design pieces. The reception is important too, but the house is essentially a warm interior for oneself – you spend a lot of time there. The design is something solid, lasting over time, thus it is considered as a good investment. Nevertheless, I think that the situation is changing today. In France, this Nordic warmth and comfort are starting to find their ways into French interiors. Nordic trends are arriving, not only aesthetically but also in terms of perception of space and everyday life. In Finland, the historical weight of Aalto and Artek is still ubiquitous, and the design scene is sometimes criticized for its problems of renewal. What do you think about the status of the current Nordic design? It’s never easy for young designers to overcome a glorious and heavy past. I think this is especially true for Finnish and Danish designers. At the same time, it is a good challenge for the next generation – to confront the past, to be able to bring their own vision and way of doing things. There are many interesting young designers in the Nordic countries at the moment. Actually, I think we can not really talk about national identities when we talk about design: the field has become so international. In October 2017, we exhibited Ilkka Suppanen at the Maison Louis Carré, who is currently one of the most important Finnish designers. In the exhibition, he mainly exhibited glass creations – made in Italy where he lives and works – but also a piece called Burning Aalto. For this, he took the classic three-legged Aalto stool, No. 60: created a metal shell around it, and burned the wooden seat inside. He spoke to me of his great admiration for Aalto: for him, it felt legitimate to create this piece because he had already assimilated the heritage of Aalto and had made his own name apart from him. It was a liberating act, yet full of respect. What is the exhibition program for this year? The next exhibition will focus on the Alvar Aalto Medal, which was created in 1967. Since then, the prize has been awarded every two or three years to innovative architects who have something in common with Aalto’s approach. Last year, amazing Chinese architect Zhang Ke was awarded. In the upcoming exhibition, we will present the Aalto medalists and the work of this architect. In autumn, we will exhibit beautiful portraits by the Finnish painter Viggo Wallensköld. Obviously, the big event of this spring is the retrospective of Aalto at Cité de l’architecture et du patrimoine in Paris. We have borrowed several pieces for the show: furniture, sketches… Once a month, there will be shuttle buses between the Cité and the Maison Louis Carré. This is the first retrospective of Aalto organized in France since thirty years – a great opportunity for the public to discover his work. What is your favourite destination designed by Aalto, besides the Maison Louis Carré? There are many, of course. If you think of private houses, Villa Mairea in Finland is superb. The church of Imatra, located in the middle of the forest in eastern Finland, is very beautiful too. The volumes and lights of the church have much in common with the Maison Louis Carré. The particularity of Aalto is to anchor its buildings on the site: he was always sensible towards the environment, but also kept in mind its users and the wear and tear of the building. Thinking about the life and evolution of the building creates something timeless, and that’s why his buildings dating back to sixty years still look so modern. To take the example of the Maison Louis Carré, it is a villa set in a very French landscape, on the hills of Île-de-France. While making plans for this building, Aalto clearly took into consideration the environment, the requirements and the lifestyle of the couple Carré, who wanted to both organise receptions and preserve a private life. It is a work of maturity, born from the encounter of two cultures and great personalities.